This article is part of my FREE e-course Art Journaling 101 – which has been designed to gently introduce beginners to the basics of art journaling so you can find your way with more ease and less fear. 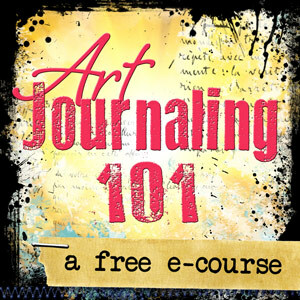 If you’re curious about art journaling or overwhelmed with how to begin, sign up for the full free course HERE. Type of Paper – Think about what types of mediums you’ll be using in your art journal. If you know you want to play with watercolors a lot, perhaps you should choose a book with watercolor paper. If you’re going to be using mostly dry media like colored pencils, crayons, pens, and markers then thinner paper will work just fine. If you’ll be using a variety of mediums like acrylic, watercolor, markers, and more, then you may want to go with a mixed media paper, watercolor paper, or something thick like cardstock to be able to withstand all of the water and layers. But that’s not to say that you can’t use whatever you have laying around, or that gorgeous notebook you found just because it doesn’t have the right paper. Time vs Money – When it comes down to it, you have to decide which is more important to you, saving money or saving time. Usually, blank journals with thicker pages are more expensive; but you’ll be able to dive right in with your journaling with little to no prep. Your other alternative would be to use a cheaper book and “beef up” the pages to be able to handle your creative play. If the pages are too thin for your mediums, you’ll need to “glue” two or more pages together with gel medium or a glue stick in order to make them thick enough to support your layering and paint. Then, if you don’t like your pages getting wrinkly, you might want to put a coat of gesso on each page to prepare it to accept your paints. This prep work can get very time consuming, but can be worth it if you’re tight on cash or can’t find the perfect journal. Stability – There’s nothing worse than putting all of your heart, time, and energy into an art journal only to find it falling to pieces when you’re finished. If you’re considering a blank book not specifically made for art, or perhaps an old book to recycle, you’ll want to look carefully at the spine. Some books are held together with glue, which will only lead to disaster after continued handling, and after applying wet mediums and additional weight with layers. You want to make sure the book is bound by stitching (or use a spiral notebook). To check if your book was bound by stitching, try finding the center page. Each “signature” or section of pages will be stitched to the spine, so you’ll be able to see the stitching when you open up a signature. You may find it difficult to find the center of a signature in some larger hard cover books; in that case, try looking closely at the pages where they meet the spine. If they’re stitched together, you’ll notice that the paper has been folded in half to create two pages. Size – If you’re just starting out, a smaller journal may be less intimidating. But larger journals provide more space for journaling and play. If you’re unsure, a good size to start with is around 6×9″. It’s just big enough to paint, doodle, and journal; but small enough as to not scare you off! 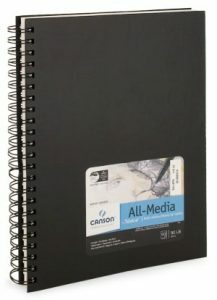 Moleskine (or similar bound journal) – Moleskines seem to be the #1 choice for most sketch book artists and many art journalers. Their quality is supurb and they come in many different paper types (not to mention, they look so awesome when all filled up!). If you plan to use wet mediums in a moleskine I would recommend going with the sketch book or watercolor book; their other varieties have pages that are much too thin. Spiral Bound Journals – There are a wide variety of spiral bound notebooks which are great for art journaling. You can find ones with any type of paper you need such as the all-media book I have pictured here. Artist Robin-Marie Smith shares how she disassembles her Canson journal to work on the pages separately in this video HERE. Handmade Journals – Handmade journals are always a great choice because you can be rest assured that the binding has been stitched for a sturdy book, and they’re usually made with sturdy paper. They are also the most attractive books to use (in my opinion) since they are handmade by artists. You can usually find handmade books in specialty shops or online. Or, learn how to make your own to customize it to your needs! Composition Notebooks – Composition books can be found just about anywhere (especially at the start of the school season!) and are super cheap. The only problem is that the pages are pretty thin, so you need to do a lot of prep work if you want to paint in it. But I have found these lined notebooks to be my most favorite tool for art journaling! The prep work turned out to be quite enjoyable for me. Plus, I find them to be less intimidating than other journals, and allows me to get loose and not care about what the final result looks like. 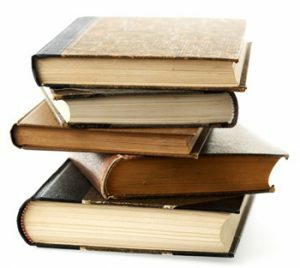 Old Hardcover Books – You can pick up old hard cover books for cheap at a thrift shop or rummage sale. They are great to use for art journaling because they are usually durable and they provide interesting pages to begin with. There is a ton of info online on how to use a hardcover book for journaling, but I have found this article and this video to be pretty helpful. Great post! I liked the link to the composition book art journal. I’m not sure I’ve ever seen one of those look so nice. I use moleskine sketchbooks. I like them for acrylic and collage, but they are not so good for water media because the water just sits on the page for a bit before it sinks in. I also like them because they don’t seem so precious, and it’s easier to get over the white page syndrome. I know, I couldn’t believe what she did with that notebook! I have to give it a try! just love your handmade journals! there beautiful! and so great for art journaling. ive never used a moleskine book, they are expensive here in the uk so im experimenting with old books, (pages get very cardboardy and stiff when gessoed and painted, collaged and gel mediums used which is great for an old family photo ‘heritage’ art journal gives just the look i want. i also use a small cheap ready made notebook with a hard cover, gluing pages together which works great but…. do you find that if the books are closed for a while when they have gel mediums on the pages over the art work or mod podge for collage , that they stick together,? i’m having to leave them open to dry for days, or am i using too much meduim on the pages? they feel dry but still stick together . very frustrating! also the notebook is getting hard to close , im not sure how many more pages im going to be able to use in it really… so back to the drawing board! Thanks so much Paula! OH YES I am having the sticky pages issue! I’ve researched this, and it seems like only some people have this issue.. which leads me to believe that it may have to do with the humidity in our area. Do you live in a humid area? Also, the shinier the product, the more its likely to stick. For now, I’m putting wax paper in between my pages so they don’t stick. I’ve also rubbed a little baby powder on the page which works great even though it adds a layer of white on top. I’ve also heard that a wax medium may work (like this here: http://amzn.to/OITviz) but haven’t tried it myself yet. I have to use wax paper in my art journal too. Maybe it is the humidity, I don’t know. All I know is I have to deal with it, and adding wax paper pages isn’t a big deal. This was great and very informative. I am working in a large spiral sketch book…my first art journal…I only began two months ago. However, I love the space in it to ‘play’. I like the links to the hardcover and comp journals…thanks. I am so glad I joined your E-Lessons. Your advise and information so far has been invaluable. So many little things have already cropped up (have only been with you for 4 days!!!) that I did not know and will be sure to try in my next journal. Many thanks. Always look forward to checking my email inbox now. My first art journal was a bound sketchbook. The paper was fine but because I use a lot of mediums it got too thick and the binding went all haywire. For my current one I am using the spiral Mixed Media one by Canson in the large size. I like this much better! Oh no! Sorry to hear your book is falling apart. I had heard good things about that journal. All of mine have leaked between pages too. I’ve learned to live with it. I used to put masking tape down the middle, but I have found it peeling up, even with the gesso and other layers over it. Mod podge needs to be sealed or it will always get sticky. I don’t know about gel medium because I don’t use it. It’s too expensive for my taste. Anyway, a quick spritz with a cheap acrylic sealer solves the sticky mod podge problem permanently. I too am very much enjoying your tutorials! It seems I can’t get enough education when it comes to mixed media. There is always something more out there! Thanks so much for that tip Melody! I’ll be sure to give that a try. Its 65lbs. So I guess this means nothing wet? Hi Janelle! Yes, usually sketch paper is a bit too thin to use a lot of wet medium on. But, there are some such as the moleskine journals that say “sketch”, but many people have had success with. I’d give a page a try, and if it doesn’t hold up well, you can always put a layer of gesso on first. Maybe try putting a coat of gesso on the page first. it seals it a bit. makes it stronger to hold up to more mediums. And it has a slight “tooth” to it to help grab products. Just an idea. Terrific post, thank you for all the info and the links you provided! It’s always interesting to see what others are using and find out why, and I find my tastes change from time to time, so experimentation is always a good idea. I don’t think there’s one “right” answer for all of us, and it’s nice that you provided so many options for artists to think about trying. I signed up for your free AJ course a few days ago, & I’m finding all your tips very useful. I started to journal at the start of the year, but there’s always so much more to learn. I recently altered the cover of a hardback book, & thought it would make a great journal, but sadly the pages are just glued, so I’ll be looking out for stitched ones in future. My medium is mostly collage, with some doodles and other things. I’m not limiting my media, just doing what I’m comfortable with. I joined your free art journaling ecourse a few days ago because I was tired of constantly having to search the Internet for new ideas and information. It’s nice to have a teacher. That’s a great idea Sarah! I love how flexible that is, you can add and remove pages so easily. Just wanted to say that this is a very generous thing you have done to share and inspire so many people! Enjoying this information! Thanks! Hi, Kristal: As i commented before, for me it was very dificult to select a journal. First bought one very small, and fancy!, which i carry on my purse to draw “flowing art juices” anywhere, in special those long hours at the doctor’s offices. Finally i got a 9×12 with heavy 56 pages and spine, which i reccomend, and at a good price, around $8- $9. Really, from my experience, i think this course is a most for every starting mixmedia artist like me!…thanks again for this opportunity! My favourite journal is an old hardcover book. I find that even when I am at a creative low, I have enough energy to prep/put a background on a journal page, then leave that page for when inspiration strikes. I also have lots of them, so I don’t have to wait for things to dry, even though a heat gun does work, I still like to let the background sit for a day or so before I go over it. Of course, my main problem is the routine and that is what I am working on at the moment. Love this course. this year I will be using a 3 ring binder. I love the size and will more than likely be able to fit the art in. This is amazing. I thought about using a book because they are so cheap but then they take up sooo much time to get ready. 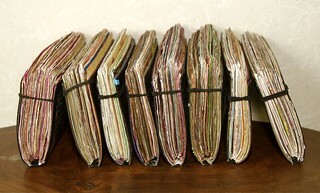 And then I end up with just as many pages as other smaller journals. I am thinking of just using a smash journal but I don’t know. Christy’s video is fantastic. I have an old library book about the Victorian era that I think will be perfect for art journaling. I love the idea of recycling the old book and there are already so many interesting pictures in it, I’m sure it will bring me inspiration. This was so informative. I have always wondered what’s the best journal to use with all the different mediums. Personally I like to use paints and was having difficulty finding something to hold it well. I believe I will give the Canson Journal a try. Thanks so much! I’m just getting into the art journal thing. I’m using a K & Co Smash Book for my first journal. I’m really excited everytime I check my email now, I can’t wait to go through your lessons!! I can not express how much this means to me. I was prepped to take an online course, but it was over $150, and I can’t afford that right now. This is SO amazing to me, that this is free! Thanks again for all the lessons & great tips!! I am enjoying these e lessons very much. Thank you! In the altered book segment above by Christy Sobolewski her approach is the total opposite to a workshop I took and I like it much better. She says she doesn’t glue pages or use gesso, but stops there. Talk about a cliff hanger! Do you know where I could find the continuation of that series on altered books as I am very interested in that art form as well. I am so taken by the fusion of art that has apparently taken place while I was sleeping, LOL. I use a beautiful leather-bound journal that was a gift many years ago. I thought it was too “Precious” to use, then realized art journals are for fun so I dove in. The pages are craft so sometimes it’s difficult to get watercolor to look vivid. I often leave a page thinking it’s just not right only to return to it the next day and love it. Thank you for explaining the many different types…along with the pros & cons of each one. Very helpful. The link for the video on how to turn a hardback book into an art journal has become obsolete. Says it’s a private video. Might you have an updated link for that? I’ve got an ARC notebook from Staples and have the hole punch. It strikes me as a good idea to create my own art journal this way, as a disc/roller bound book would let me slip in pages of different sizes, weights and types to move around in the book as I please. Once it gets too thick, I can then just take most of those pages out and “archive” them. I love your art journal 101. The first thing I do in the morning is check my emails and read what they have for new tips. I’ve made a few weeks ago a Midori Travelers Notebook myself. Even the notebooks that come in there. 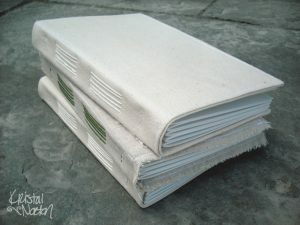 It currently has 4 notebooks with paper of different weights, I handstiched each of them. The size of my Midori is perfect, on the go I have it with me and at home it is on my desk. So I have it always to hand if I want to use it . It is just perfect for me. I’m going to start with a visual journal as they are inexpensive until I gain confidence. I bought one a couple of years ago with a removable handmade felted cover. It’s been just waiting there for me to find a use. Enjoying the course so far. Thanks. 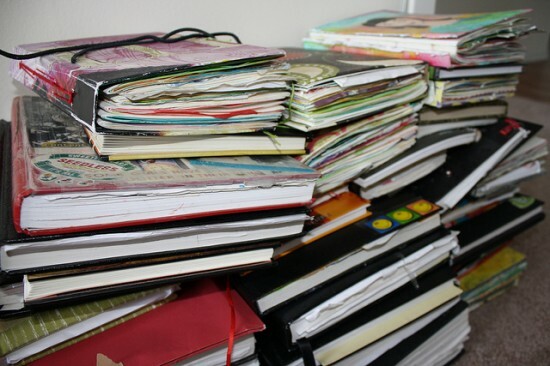 Are you still making journals? If so could you make one in the size 9×7/6? I used a smaller journal last year to see if I really wanted to art journal. I am loving every second and I am wanting to do more. The problem is I have no idea what to do. I would like to go bigger but most books are either A4 or A5 and no inbetween. I don’t want to prep my pages because that take away from days I could be doing art. So if you know any book around that size I be really grateful! What got me started on this whole new art/journaling journey is an online class called Remains of the Day Journals given by Mary Ann Moss. She teaches how to make journal covers as well as journal pages with found materials. I have two covers made and lots of signatures, but I haven’t bound them into books yet. I am too busy making journal pages. I love that there are so many different options (for pages and covers). I really like the moleskin covers shown above. I am just amazed at how much I love this process. I have a deep desk drawer full of beautiful journals that are either blank or have maybe a weeks worth of “journaling” in them. I know that journaling is therapeutic and good for you, but I didn’t know it could be so much fun. Somehow the combination of art and words has unleashed my creative Kraken which is an obscure reference to an old ‘Clash of the Titans’ movie. I’ve haven’t done this much ‘art work’ since I was a kid. And, I’ve never considered myself an artist. Now I’m not so sure. I just might have some art in me after all. I am enjoying this class and look forward to learning more. Hi Kristal, the link to your ETSY shop says your on vacation. Are you still taking orders for your blank journals? Hi Kristal. Thank you so much for offering this course, especially for free. As far as journals go I personally prefer making my own. I can choose the paper (my favourite is mixed media paper by daler-rowney; it has never let me down and I’m not particularly gentle!! ), the size, how many signatures, and there are so many ways of binding them, accessorising them, with or without cover. The choice is yours. To me making my own journal is part of the fun. If I take a class, I tend to create a journal just for it. It makes the whole experience even more special to me. I’m currently using an old spiral-bound notebook. I have used it for many purposes before and have torn off about a third of the pages, so it was quite thin when I decided to start art journaling in it. Its pages are quite thin, but I’m not too worried about that. I do like the idea of art journaling in an old book. Once I finish the spiral-bound notebook, I might look into that. I have a lovely, expensive journal that I bought a number of years ago. It has heavy watercolor paper that looks like cold-press or rough. I did not use it because of the old “too precious” issue. I also worried that the paper was too rough to glue images to the page. Any thoughts? So I was thinking of just buying a big binder and those clear sheet protectors and using it to hold the pages of the journal… I would use regular print paper and gesso over the ones with water color. I’m just starting so Im going to be trying lots of different things and I like this idea so that there’s not to much wear and tear… of course i would have to wait til drying to put in the sleeves… what do other people (who actually have experience art journaling unlike me) think about it? I’m using it as a self-discovery/ mental health journey type of thing. If that feels right for you, go for it!! You won’t know until you try. I do this with my kids’ artwork and it works well. It gives you a lot of flexibility to change up your paper if you wanted to, and the freedom of working outside a journal. But for me personally, I don’t think I’d like it. I like holding my journal, and watching it grow fatter with love. And putting my pages in sleeves might make me feel like I’m showcasing it, which may lead to me reverting back to my perfectionism. I am a brand new beginner. I have started my first journal. Every year at this time I have to buy a calendar, so I buy a a calendar in journal format. I am starting out with things I have, colored chalk, colored pencils, water colors, gel pens and what ever else i have around the house. I like to put bible quotes, did you know?? ?, and various appoitments. I am basically just coloring in the book and drawing. After I complete this I want to see where it takes me. I like the spiral bound paper book…but they can be pricey if you create art often. So, sometimes I just buy lined paper and keep them in a binder, that way my writing can go in too.